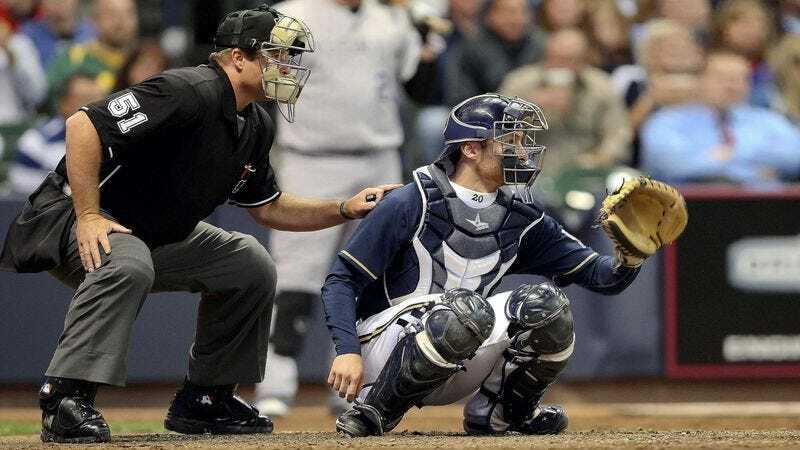 MILWAUKEE—Home plate umpire Marvin Hudson asked Brewers catcher Jonathan Lucroy to move forward “just a little” during the second inning of Sunday's NLDS game so that Hudson could have some more room and see better, nearby sources reported. “I’m getting a little cramped back here, so could you scootch up a bit?” Hudson reportedly whispered while gently nudging Lucroy in his lower back. “Little more. Little more. Little more. Little back. There. That’s perfect.” Both Hudson and Lucroy stood up and reevaluated their positions when, after an ensuing pitch, they realized they had ended up 5 feet in front of home plate.